← But wait, Moms don’t get sick! Day 1 of the new battle against the appropriation of my handbag. I have done an initial investigation into who the actual perpetrators are and found that further monitoring of the first born will be required. Second born is not yet mobile on his own, so I have made a mental note to review the situation when he too starts walking – we may need to upgrade to carry on luggage when that happens. I found the above pic and could absolutely relate to it. I have recently noticed that majority of my handbag contents actually belong to my kids, or they are there for my kids in case of an “emergency”. The most common “emergency” situations would be when Paige has a snack and her hands end up feeling like she’s been playing with crazy glue (note: see wet wipes), or when James wakes up from a deep trolley slumber with a sudden case of starvation as I am about to pay at the store checkout counter, because apparently he never gets fed – little fatty (note: see frog toy). Before James was born, I had miraculously been able to upgrade myself from nappy bag to handbag because you don’t need to lug around so much stuff with a 1.5 – 2 yr old (ie: formula, bottles, splash nappies etc etc). All I needed when Paige & I went out for a few hours was a single nappy, some wet wipes, her water bottle and dummy. Alas, that drastically changed when James arrived. I went back to the nappy bag permanently, but 6 months in I am slowly transitioning back to my handbag for short outings (now that he doesn’t eat and poop as often – James, not the handbag – duh). BUT I find my handbag has been usurped by my children and I’m the dodo that still has to carry the darn thing around. It contains a few permanent kiddy-things that I have put in there for good reason (wipes, crayons, frog, snacks) and then an abundance of items that Paige has added just in case she needs something while we are out (which has never happened FYI because she usually forgets that it is in there). I emptied a whole lot of items out this weekend (toys, hairbands, kid jewellery etc) but since yesterday, the following items have found their way back in. Note though, that after I took this pic, I was looking for my lip ice and also found a small box of smarties, a pink beaded bracelet, some mis matched hair clips, 2 puzzle pieces and 5 stikeez. Top tip for moms with toddlers – carry crayons at all times. I have a small soap box that the crayons fit into perfectly. It has saved me from Captain Cranky-Pants (my alter ego name for cranky Paige) a few times when Paige has gotten bored somewhere and you foresee a melt down of biblical proportions coming on. You can always find paper for her to draw on so it’s a great activity item that doesn’t take up much space at all. Anyway, I will be attempting to reduce the unnecessary clutter in my handbag so we will see how that goes (won’t hold my breath) as I figured I should try and control it now as it will only get worse when James also ‘needs’ to take certain items out with him. schedule an appointment with the physio for them to beat out the knots and relieve the strain on my right side. make a note of physio costs to be refunded to myself out of kids pocket money (when they start getting it). 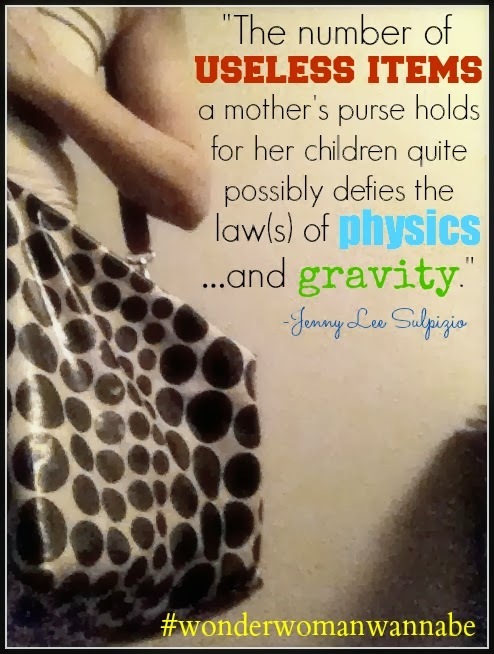 This entry was posted in being a parent and tagged handbag vs nappy bag, mother of 2. Bookmark the permalink.